Visiting international surgeons with Department Chair Dr. Rebecca Minter, Dr. Girma Tefera, and Molly Vaux. 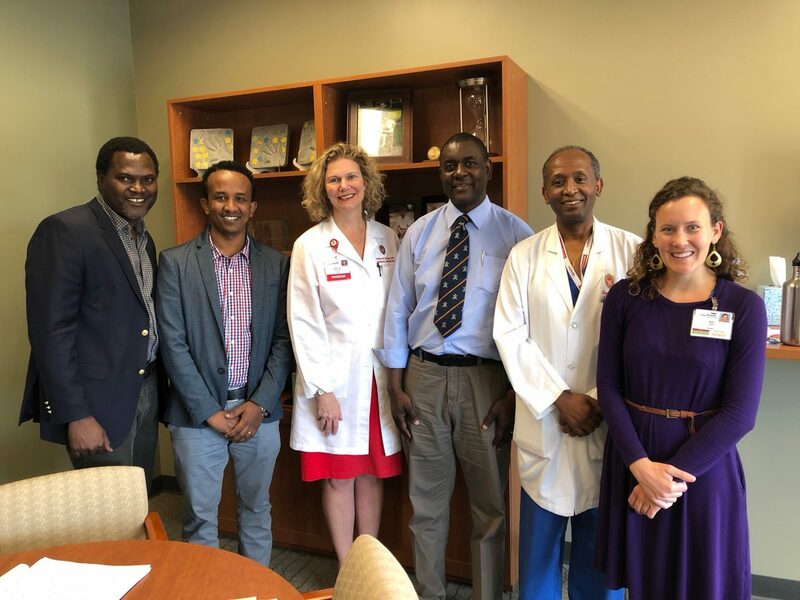 Recently we were proud to welcome three international orthopedic surgeons for a global collaborative meeting: James Munthali and Emmanuel Makasa from the University of Zambia Hospital, and Ephrem Adem from Hawassa University in Ethiopia. During their visit, they toured UW Hospital and met with key global health partners and faculty members in our Department. Girma Tefera, MD, led the visit with assistance from global health specialist Molly Vaux, MPH. This is the latest in an ongoing global learning environment collaboration with surgical colleagues in Ethiopia, and the beginnings of a new partnership in Zambia. You can learn more about the visit on the UW Global Health Institute’s website.